After Colas mentioned Atlantis sups in Australia,i had a look at their site.The Bam Bam shown is one of their models.Couple of sizes biggest I think is 6'8" and 124 litres around the 32 wide. Whats up with these ridiculous shapes! It is the ugliest board EVER... It doesn't even look half good! People need to get off their pedestals and trying to ride boards as small as they can. It is proven that this shape is not efficient. Because Medina, Slater, Mick, Wilson or any of those boys can ride a board that 4'2" x 22" doesn't mean that they're going to... because it would surf like a PIG! It is proven that this shape is not efficient. I have ridden this kind of shapes for years now. It is the best thing that happened to me SUP-wise. See www.seabreeze.com.au/forums/Stand-Up-Paddle/Review/New-610-Simmons-SUP/ The Bam Bam seem a copy of the Gong shapes, up to the strap inserts (but with more boxy rear rails). I guess people in OZ have now an inexpensive way to try ShortSUP for themselves. It is because I am unable to ride a 4'2" x 22" that I am so glad some shapers innovate and make boards that are both extremely fun and easy to ride. My 6'10"x30 is incredibly stabler for my 100kg than my 8'2"x27.5"
Of course, you do not need these kind of shapes if you ride world cup spots. Just like you will suffer with an Hawaian gun in daily waves on an average spot. Very true Colas. .... and yeah.. the Atlantis manufacturers are putting out cheaper boards that have a reputation for not really standing up to a lot of abuse....but then, so do some major, big price tag brands! Ultimately, you do get what you pay for...but knowing that you can have a go at short sup surfing for half the price... is a good option! What a nice board, indeed. The guy behind Atlantis has a bad rep. Not only has he been dogged by a bad rep for shonky boards and screwing industry over, he had to move not once but twice because it got so ugly. What evidence do you have of this. I think your just spreading more rumors. How has he screwed the industry over? There is 100's of cheap Chinese board brands all over the country surfboard warehouse isn't the first. The surfboard warehouse owners are a great people from my personal experience. They never try to say their boards are better than others they are in the market of giving cheaper options for new comers or occasional users. They aren't selling high end boards. the people who buy these boards and expect them to be bullet proof are kidding themselves and it's there fault for not doin there homework. Forum and and bagging out the business with no real evidence. Maybe they moved cause they bought there dream home on the creek because there hard work over the last few years running a successful business is starting to show its rewards. Basically you need to add (in kg) the weight of the rider, paddle, wetsuit, and the board. This gives you the minimal volume to float in liters. Add some liters for confort. For me it is 10 to 15 liters. This means that for my 100kg, 120 to 125 liter boards are nice. My 6'10" Simmons is 126 l. 110l is too tiring for me to be worth it. I managed 100l once in glassy conditions, but was exhausted after 20mn. Wide nose & and tail are stabler, so you can decrease the extra "buffer". On Atlantis, they can be bad boards, I don't know. What I know is that some people tend to spread false rumors a lot in the Surf/SUP business world. What you should check is the rails. Very often, on cheap boards the sanders do not have time to do a proper job, and tend to sand too much, removing the glass, and hiding the holes with paste, with the result of rails digging very easily in places. Maybe other Atlantis owners can give their feedback? Check also the alignment of the fin boxes. Cheap builders don't care and you can see that they are not symmetrical for instance. I'm new to the sup community but have been kitesurfing for about 4 years now and will only run Cabrinha gear. 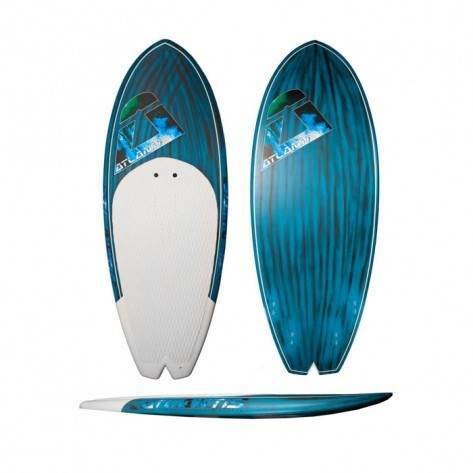 I looked at the Naish at first as I was familiar with the brand but settled for an Atlantis Vex for Christmas. I chose the Atlantis as it had reinforced kevlar rails, carbon wrap and 12 month warranty when no others could offer me those features, the dude in the store actually showed me a video of the board being run over by a truck and it held up, so as far as I'm concerned it should hold up just fine out in the surf. My name is Tim Beban and I am the owner of The Surfboard Warehouse. Unfortunately I have come forth to dispel some myths and untruths I often see posted on this forum by the same offenders. These are usually people posing under fake names having direct association with opposing brands. You don’t have to be a rocket scientist to see through their smoke and mirrors. Especially when they post photos and they don’t realize their location and company name shows up where they post from… oh nooo! I actively advertise on Seabreeze in the correct manner and abide by the rules of this forum. I am not here to sprook my brands or for personal gain but merely to set the record straight. I lived in my unit on Burleigh Point for 15 years but recently moved into a house on Talle creek with my wife and 2 year old son for the love of Supping… not because a hooded gang of ugly industry folk chased me down with burning pitch forks. That made us all piss ourselves laughing… seriously entertaining!! We currently employ 47 staff in Australia, We have 4 large warehouses, 5 retail outlets, a dog, a cat and a gold fish named Robbie. We have been winners 2 years running in the Gold Coast Business Excellence Awards. Our business more than doubles in size each year due to the fact we sell bloody strong amazing boards not “shonky” product. Pretty hard to warrant “shonky” products for 12 months I would say, plenty have tried and failed. In my opinion the best way to source the truth about a product is go straight to the source and ask your local ding repairer. On the Gold Coast we use “The Ding Shop” and he will tell you the truth about all boards and brands.. good and bad. My wife and I started the company only 4 years ago, we have no investors other than repeat customers, we pay our debts, we pay our taxes and we pay our staff. I design the boards and seek 2 professional shapers advice on all prototypes as well as some “industry” folk who advise on lamination. We invest heavily in Good Blanks, Glass, Resins and also love to challenge the common miss conception “You get what you pay for” by re-enforcing our boards with Kevlar, Carbon and PVC and on occasion running our boards over with 2 tonne vehicles to silence the critics (obviously need to work on this). Our boards are made in the same factories who produce the majority of “high end” boards you see on the market for twice the price. I have kept the photos for a rainy day. We sold over 7500 stand up paddle boards in 2014 which if I’m not mistaken makes us one of the largest SUP distributors in the “Industry”. Hang on.. does that make us industry?? I don’t own a pitch fork though? It only takes one Douchebag with an ulterior motive posting defamatory remarks about someone he doesn’t know from a bar of soap to motivate an already extremely motivated human. The company you are associated with and that you, sorry, your “brother” keeps referring to has already been warned about defamation. I have 47 pissed off staff members who’s lively hoods you mockingly threaten every time you think it is a good idea to post untruths. I’ll be at our showroom at 20 Christine Ave all next week if you would like to pop in and lay down with us dogs for a chat. Very well said Tim. I wish you every success in your business. Excellent response, and funky design that I'd love to try out. Both my two boys (2 & 4yo) love being on the water, and the 4 year old now want to surf on his own! Who said what now? This is a forum that is full of opinion and vitriol.. I would not be worried about answering anything - just makes more out of it than really is! And of course.... someone got a freaking good bite while fishing. Give them not the satisfaction! now back to this board, i likey. any more details Tim? Hi Caution, We originally designed 4 prototypes of these boards in different sizes and rode them in varying conditions. I saw a few clips of guys in France riding similar dimensions and they were throwing the things around like shortboards and completing maneuvers above the lip. These guys knew what they were doing and the board seemed really functional so credit should really go to them. I have merely taken their idea and attempted to add to it. The deck carries volume right to the rail and in order for it to “bite” we had to dramatically drop it a couple of inches from the rail edge. Similar concept to a step deck, but without the step. Width through the tail area was needed to compensate for the boards lack of size. We have been experimenting with a few “Dropped Swallow” PU fish and thought this would be a perfect match. All in all these boards are geared to advanced riders and are out of control fun in clean waves. Choppy conditions give you a good workout though. We have refined these boards even more through the tail and decided on just 2 sizes – 6’10 x 31 x 5 & 7’2 x 32 x 5 ¼ (we also do customs). These boards are due at the end of the month and I’ll have a few samples ready for people to punish. Construction is 15kg Blank, PVC, Carbon sandwich. Love to hear more feedback from guys like Colas who know whats up. Let Colas speaking about, he is an addict of those boards and have better speaking than me. Just say i'got a 6'4" 29.5" 84 liters to my 76kg, and it's fine in good conditions . Gonna give my board to my 32 years son who is a experienced surfer to start doing SUP. At 31" wide , this the board to follow on fun when conditions make you give up surfboard. Is that 15kg/m^3 or are they actually that heavy? New ones have 15m^3 cores due to the strength of the PVC wrap. Weight is around the 6.5 kg mark. For the 2 new sizes. We are doing a few customs as well. Sweet looking boards. What's the volume on the new 7'2? Frankly, these boards seem very nice from the pics. And it is good that you seem to be testing them yourselves and make the design evolve with your feedback. Also a central FCS plug can be useful for a nubster. I can say that kevlar on the rails adds impressive strength, as I can see with the Gong boards. Hi Tim..Is there a particular reasoning behind the swell tail? rather than say a rounded tail? Good on you Tim, well put. Now you 're talking 6'10 & 7'2 I'm real interested. Keen to know volume of these ones. I have bought 4 Atlantis boards, including the 8' carbon vex a week ago. Started with the 8'8" 2 years ago and have worked my way smaller as skills improve. Can't really do that with a board that costs $2000 plus. No issues with board durability, service etc. Good on you Tim for competing successfully with all the "known" brands. Can't wait to have a go on the Bam Bam.